- Went 3-3 with a 2.66 ERA (44-IP, 13-ER) overall as a senior at Central Michigan University, including 3-1 with a 1.98 ERA and 7 saves, fourth most in single-season school history. - Played previously at Heartland Community College from 2009-10. - Earned All-Area and All-State honors as a junior and a senior at East Leyden (Ill.) HS. - Previously selected by the Chicago White Sox in the 17th round of the 2008 June Draft. - Named First Team All-Big Ten and Academic All-Big Ten in 2012 after hitting .318 with a .432 OBP. - Finished first in Illinois history and fifth in Big Ten history with 98 career stolen bases. - Named Third Team All-Big Ten in 2009 and 2011, and combined to hit .312 (179-for-574) with 20 homers, 107 RBI and 76 stolen bases at Illinois from 2009-11. - Broke the school record with 41 steals in 45 attempts in 2010, ranking fifth in the nation. - Named a Louisville Slugger Freshman All-American in 2009 and was also named Third Team All-Big Ten and Big Ten All-Freshman team. - Has been drafted twice previously…Pittsburgh drafted him in the 43rd round in 2011 and Arizona drafted him in the 49th round in 2008. - Hit a home run in the 2001 Little League World Series against the Bronx, N.Y. team that featured Danny Almonte. - While at Illinois, was a member of National Honor Society and the Student Ambassadors. - In 2012, hit .325 (41-for-126) in 34 games as a fifth-year senior at Texas Tech University…in 2011, was an All-Big 12 Honorable Mention and an Academic All-Big 12 First Team…sat out the 2010 season after transferring from Baylor University…played previously at Midland College (2008-09). - Played for the Falmouth Commodores of the Cape Cod League in 2011. - Previously selected in the 37th round of the 2011 June Draft by the Los Angeles Dodgers. 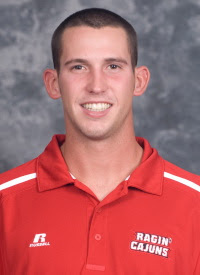 - His father, Dale, was a 4-year letterman (1981-84) in the Red Raider baseball program. - Was an energy commerce major at Texas Tech. - Named the 2012 NCAA ABCA/Rawlings West Region Player of the Year and Player of the Year by Daktronics and by the National Collegiate Baseball Writers’ Association. - Named the California Collegiate Athletic Association’s Most Valuable Player after he led the conference in hitting (.451), slugging percentage (.533), hits (79), runs scored (47), doubles (23) and walks (33). 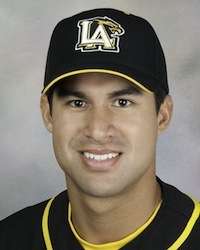 - Previously played at Riverside City College, where he was named All-Orange Empire Conference in 2008. - Grew up and went to high school in Guayaquil, Ecuador. - Enjoys surfing and ping-pong. - Went 3-3 with a 3.42 ERA (50-IP, 19-ER) in 17 apps, including 6 starts, during his junior season in 2012. - Played previously at North Central Texas College where he was named to the Texas/New Mexico JUCO All-Star Team in 2010. - Previously selected in the 30th round of the 2009 June Draft by the New York Mets. - Earned Great Northwest Athletic Conference First Team honors after going 5-2 with a 4.65 ERA (62-IP, 32-ER). - Went 3-0 with a 3.62 ERA (27.1-IP, 11-ER) in 4 apps, all starts, for the Wolves in 2011. - Played two seasons at Chemeketa Community College (2009-10) and was named Northwest Athletic Association of Community Colleges Southern Region All-Star in 2010.  Is a criminal justice major and psychology minor. - Named 2012 Pac-12 Pitcher of the Year, 2012 Pac-12 All-Conference and a 2012 Golden Spikes Award Semifinalist. - Pitched for the Cotuit Kettleers of the Cape Cod League and finished the summer with a 2-2 record and a 3.03 ERA. - In 2010 was a Pac-10 All-Academic Honorable Mention. - Pitched for the Glacier Pilots of the Alaska Baseball League in 2009, a summer league team which counts Greg Dobbs (2000), Jacoby Ellsbury (2003), Ben Francisco (2001), Eric Hinske (1996), Ryan Ludwick (1997), Mark McGwire (1982) and J.T. Snow (1987) among its alumni. - Previously selected in the 38th round by the Minnesota Twins in the 2011 June Draft. - Majored in political science at Oregon. - Went 6-3 with a 3.15 ERA (85.2-IP, 30-ER) in 13 apps (12 starts) as a senior at UC-Davis. - In his previous three seasons at UC-Davis, was 11-17 with a 4.51 ERA (238-IP, 143-ER). - Owned horses and was an avid rodeo competitor when he was younger. Because Quist is a redshirt senior, he has little to no leverage to increase his signing bonus. He couldn't care less. "It's definitely not an issue at all," Quist said. "I know it's going to be next to nothing. I was ready to go for a bus ticket and a PB&J [sandwich]. I'm ready to go play." Because he'll sign for little money, Quist hasn't hired an agent. He figures he'll start with the short-season Hudson Valley Renegades of the New York-Penn League. Their season begins June 18. Despite two uncharacteristic outings to close the year, Quist went 6-3 in 12 starts this season, posting a 3.15 ERA in 85ª innings. He struck out 85 batters and walked just 13. Working with a four-pitch arsenal - fastball, curve, changeup and splitter - Quist was able to shut down opponents without overpowering them. His fastball velocity ranges from 87-89 mph. "I know I can find success when I'm throwing pitches to spots, rather than blowing guys away," he said. Quist finished among the nation's best in several NCAA D-I categories: fifth in strikeout-to-walk ratio [6.54], 17th in WHIP [.960], 41st in walks per nine innings [1.37], 89th in strikeouts per nine innings [8.93] and 93rd in strikeouts. - Was on the mound for the save and got the final out as Iowa Western Community College won the NJCAA World Series…was named the Most Valuable Player of the NJCAA World Series. - Played high school ball for Central (Mo.) HS and was named First Team All-Conference Pitcher, Second Team All-Conference and was inducted into the Central Baseball Hall of Fame in 2010. - Hit .290 (62-for-214) with 3 homers and 36 RBI with the Wildcats in 2012, splitting time at catcher and first base. - During his time at Kentucky, split time at catcher with Luke Maile, who was drafted by the Rays eighth round of this year’s June Draft. - Hit .264 (46-for-174) with 7 homers in 2011 while ranking among SEC leaders in pickoffs and runners caught stealing defensively. - Previously selected in the 39th round of the 2011 June Draft by the San Francisco Giants. - Played with the St. Cloud River Bats of the Northwoods League in 2011. - Was a 2009 SEC Freshman Academic Honor Roll in 2009. - Was a Louisville Slugger High School All-American his senior season at Farragut (Tenn.) High School where he was First Team All-State as a senior and led his team to two state championships and three district championships. Keudell, the Pac-12 pitcher of the year, was selected with the 842nd pick overall. The former walk-on from Portland is one of three players remaining from Oregon’s 2009 team, when the Ducks finished 14-42 in their first season of baseball since 1981. Keudell was recently named a Louisville Slugger second-team all-American as well as a Golden Spikes Award semifinalist as the nation’s top player. Keudell is expected to start the super regional opener Saturday. He is 11-4 and staff-leading 2.38 ERA this season, with three complete games, including one shutout. In 1171/3 innings he has struck out 70 and held batters to a .226 average. His 23 career wins are an all-time Oregon record, and his 11 wins in 2012 rank first in UO single-season history. "It's definitely different (this time)," said Williams. "Being through it once, you know you can't worry about it. You go and have fun and not sit in front of the computer (watching the draft tracker). "I was hitting, and I got called. It's definitely an honor and a blessing for sure. I'm just happy to have the chance to do it again." Williams is expected to meet with an official from Tampa Bay today, he said, to talk over the contract. Argo indicated he had so little pre-draft communication with MLB teams that he wasn't sure what to expect. A Pirates scout called "two or three weeks ago," to ask whether Argo wanted to play pro ball. Then a Nationals scout called Wednesday morning, the final day of the three-day draft. "Those were the only conversations I had," he said. "I didn't know if I was going to get picked." After slumping at the plate during his junior season, Argo rebounded this year to hit .318 and lead Illinois in runs, on-base percentage and, of course, stolen bases. With 22 steals in 26 attempts as a senior, Argo finished his career with 98 stolen bases — fifth all-time among Big Ten players. Rather than texting, Foley called Argo shortly after the Rays drafted him. The conversation didn't include a signing offer. That will come in the next few days. "They're busy now with the draft," Argo said. "He said he'll call once things calm down. I have no idea when or where I'm gong to go." Rather than take his chances on returning to UL for his senior season and perhaps moving up one more time, left-handed pitcher Jordan Harrison has agreed to terms with the Rays and plans to sign early next week. Harrison plans to fly to Florida on Sunday to sign with the Rays. He'll then probably report to Port Charlotte, home of Tampa Bay's Gulf Coast League Rays rookie-league affiliate.